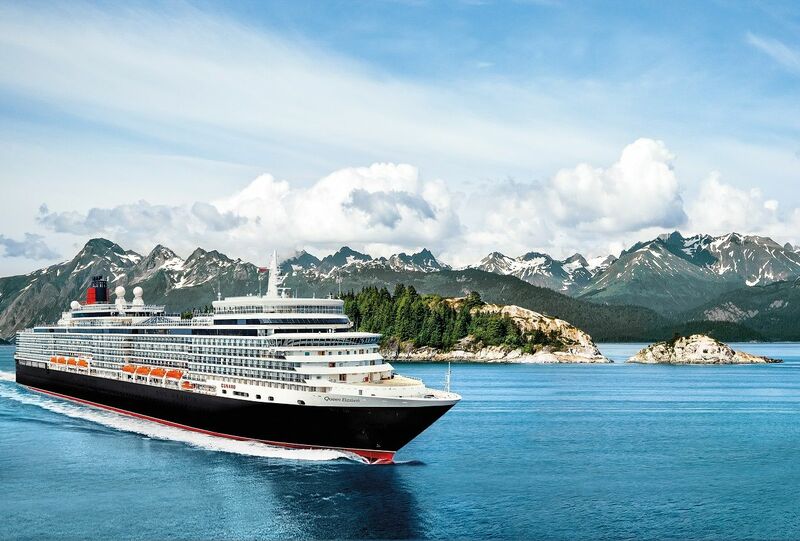 Cunard has announced that it will spend a full season in Alaska from June through September 2020 on the newly-refit Queen Elizabeth. Cunard is making its return to Alaska in May 2019 – and due to high demand, the line will double their program in 2020. This expanded program will offer ten round trip voyages out of Vancouver ranging from nine to twelve nights and one getaway cruise to San Francisco for an overnight stay on Independence Day. Queen Elizabeth, the youngest ship in the fleet, has just come out of refit this November, launching a new spa concept onboard: Mareel Wellness & Beauty, developed in partnership with industry innovator Canyon Ranch. The new brand will offer a holistic approach with a focus on the healing energy of the sea. The spa offers an extensive new treatment menu with mineral-rich seawater and marine-based experiences as well as a redesign of the entire spa facility. In addition, many public spaces, bars and lounges have been updated and all Grill Suites and Britannia Staterooms have new carpets and soft furnishings. The Royal Court Theatre had a complete technical overhaul; the Royal Arcade has been enhanced to offer an elevated shopping experience; and the outdoor decks have new furniture with a new layout on the Sun Deck. Cunard continues its partnership with Rocky Mountaineer, offering pre- and post-cruise tours on the famous railroad. Tours include either three- to five-nights’ accommodation, plus two full days aboard the train. The expedition travels through an array of scenery with glacier and snow-capped peaks of the Canadian Rockies, through winding river canyons, mountain passes and remarkable tunnels. Highlights include the Continental Divide, Kicking Horse Canyon, Spiral Tunnels and the rushing waters of Hell’s Gate in the Fraser Canyon. Guests who book launch fares in Britannia accommodations on voyages seven nights or longer by February 28, 2019 will receive free Onboard Credit up to $600 per stateroom, and third and fourth guests in the same stateroom will pay only $100 per person. Detailed information about promo code ZED/ZEB and disclaimers about these benefits can be found here. World Club members will benefit from an additional 5% discount off launch fares, available for past guests only, applicable on all cruises until April 30, 2019. This discount is not applicable to third and fourth berth guests. Fares are capacity controlled, subject to change, and may not be combined with any other public, group or past guest discount. Schedule of final payments and cancellation fees will follow the standard terms and conditions. Cabin assignment and dining options are not available for guests booking Value Fares. Guests will be booked on a Guarantee status. Value Fares are not available in the Grills. Carnival Cruise Line today announced that for the first time, it will offer a series of cruises from San Francisco, with Carnival Miracle operating a schedule that includes four- to 15-day voyages to Alaska, Hawaii and Mexico in 2020. Following strong reception to a previously announced program from San Diego in 2019, Carnival Miracle will also return to the port for a winter 2020-21 schedule of three- to 15-day voyages. These deployments further bolster Carnival Cruise Line’s position as the West Coast cruise leader, carrying more passengers than any other cruise operator. That number will continue to increase with the debut of Carnival Panorama from Long Beach in December 2019, the first new Carnival ship on the West Coast in 20 years. With the addition of San Francisco, Carnival operates from 19 North American homeports. Roughly half of the U.S. population is within a five-hour drive of a Carnival homeport. Carnival’s schedule from San Francisco kicks off March 19, 2020, aboard Carnival Miracle, and will include four-day long weekend voyages to Ensenada departing Thursdays and returning Mondays throughout the spring and summer, as well as five-day and six-day cruises to Ensenada, Catalina Island and San Diego in the spring. The ship will also offer a summer schedule of 10-day Alaska cruises round-trip from San Francisco featuring destinations including Juneau, Skagway, and Icy Strait Point as well as opportunities to visit Sitka and cruise Tracy Arm Fjord. There’s also a special one-time 11-day Alaska cruise departing Aug. 9, 2020. A 15-day Carnival Journeys Hawaii cruise round-trip from San Francisco departs April 16, 2020, calling at destinations including Maui (Kahului), Honolulu, Hilo, Kona, and Kauai, as well as a stop in Ensenada. Prior to its West Coast deployment, Carnival Miracle will offer a 17-day Carnival Journeys Panama Canal transit March 2-19, 2020, calling at Santa Marta and Cartagena, Colombia; and Limon, Costa Rica prior to the Panama Canal transit followed by calls at Puntarenas, Costa Rica; Puerto Quetzal, Guatemala; and Cabo San Lucas, Mexico. Carnival Journeys cruises offer unique local culinary and entertainment experiences as well as special activities, including a 1980s-themed Throwback Sea Day. Carnival Miracle will operate a winter schedule of voyages from San Diego beginning Oct. 4, 2020. The program includes convenient three-day getaways to Ensenada, four-day sailings to Ensenada and Catalina Island, and five-day departures that spend two full days in the Mexican resort town of Cabo San Lucas. Also offered are four 15-day Carnival Journeys Hawaii cruises round-trip from San Diego departing Oct. 16 and Nov. 28, 2020, and Jan. 9 and Feb. 20, 2021. Featured ports include Hilo, Kona, Kauai (Nawiliwili), Maui (Kahului) and Honolulu, as well as stop in Ensenada, providing guests with a variety of landside experiences in this tropical Polynesian paradise. In just 100 days, the Port of Los Angeles will welcome Royal Princess – taking guests to Mexico, the California Coast and Alaska. The ship just completed a multi-million-dollar refurbishment including several new features and offer West Coasters convenient, round-trip Los Angeles cruises starting March 23, 2019. Lotus Spa & Fitness Center – new equipment is now available in salon and treatment rooms and the latest in fitness machines is now available. The Secret Silk – the newest production show developed in partnership with award-winning composer of “Wicked,” “Godspell” and “Pippin” – Stephen Schwartz. Encore – inspired by the cruise line’s “Bravo!” and accompanied by an onstage orchestra, “Encore” celebrates the traditions of pop, opera and musical theater. The show was directed and choreographed by Disney Channel Creative Director Danny Teeson, with musical direction by Academy Awards® Arranger Nelson Kole and set design by Emmy® award-winner John Iacovelli. Royal Princess will sail on a series of cruises from Los Angeles (San Pedro) to the Mexican Riviera with port calls in Cabo San Lucas, Mazatlán and Puerto Vallarta. Royal Princess will sail up the Pacific Coast on a seven-day Coastal voyage departing May 4, 2019 to Vancouver to begin her maiden voyages to Alaska. The Alaska season begins on May 11, 2019 and Royal Princess will offer 18 “Voyage of the Glaciers,” seven-day cruises, sailing between Vancouver, B.C. and Anchorage (Whittier) with port stops in Ketchikan, Juneau and Skagway with scenic cruising in Glacier Bay National Park, plus an additional glacier viewing experience at either Hubbard Glacier or College Fjord. Guests can also spend time in the interior of Alaska with a variety of cruisetour offerings, with stays at Princess Wilderness Lodges and visit Denali National Park. A recognized leader in Alaska, hosting more guests to the Great Land than other cruise line, 2019 marks 50 years of cruising to this bucket-list destination. Royal Princess will depart Vancouver on September 14, 2019 on a three-day Coastal cruise, returning to Los Angeles on September 17, 2019 to offer a 12-day roundtrip cruise to Alaska, including Glacier Bay National Park. September 29, 2019 marks the return of Royal Princess to Los Angeles for cruises to the Mexican Riviera with several five-, seven- and 10-day options; seven-day California Coastal cruises and shorter four-day West Coast Getaway voyages, visiting Catalina Island. Gratuities – paid on behalf of each guest, up to a $15.50 value per day per guest for all guests in a stateroom, up to four. Up to $800 per Stateroom to Spend Onboard – based on the cruise length, guests booking an interior or oceanview stateroom will receive up to $400 per stateroom to spend during their cruise vacation. Those booking a balcony, mini-suite or suite will be given up to $800 per stateroom. In anticipation of the upcoming Wave season, Holland America Line is launching a Why Not Now? promotion. The special offer on cruises from summer 2019 through winter/spring 2020 includes free stateroom upgrades, shore excursion discounts, up to $1,000 air credit per stateroom and deposits from $99 person if booked by Feb. 28, 2019. Guests who book a suite with Why Not Now? also receive up to $600 in onboard spending money, in addition to the other perks. The Wave promotion comes just after the announcement by Cruise Critic that Holland America Line received the 2018 Editors’ Pick Award for Best Value for Money. The Cruise Critic Editors’ Picks Awards are chosen by Cruise Critic’s international team of editors, based on the lines and ships they feel best represent excellence in each of the designated categories. As part of the promotion, depending on departure and ship, guests who book an interior stateroom will be upgraded free to an ocean view stateroom and those booking an ocean view stateroom will get upgraded free to a verandah. Free upgrades are based on available space at the time of booking and may differ based on sailing date. Every effort will be made to accommodate. By booking air through Holland America Line’s Flight Ease program from offered gateways, guests are eligible to receive an air credit up to $1,000 per stateroom. Reduced deposits starting from $99 are available with the Why Not Now? offer, and booked guests who also reserve select shore excursions by Feb. 28 can take advantage of up to 10 percent savings. The bonus $600 onboard spending money for suite bookings can be spent on a variety of amenities, including specialty dining, spa services, shore excursions, gift shop purchases, beverages and more. Look up in the sky! You could win prizes including a free cruise. As part of the year-long celebration welcoming the new Carnival Panorama to the West Coast, Carnival Cruise Line today announced that its #ChooseFun AirShip will return with a month-long journey across California, launching on Dec. 31 in conjunction with the line’s first-ever Rose Parade float on New Year’s Day. The 120-foot Carnival AirShip will travel throughout Los Angeles, Orange County, San Diego, San Bernardino and Riverside counties and then to Northern California, heralding the December 2019 launch of Carnival’s newest ship, Carnival Panorama and inviting everyone to “Choose Fun.” The AirShip will fly over major cultural events and venues including The Rose Parade: A Showcase of Floats and sporting events, as well as visit schools, Carnival’s home ports in Long Beach and San Diego, travel agent viewing parties, and select trampoline park locations of Sky Zone, Carnival Panorama’s newest all-ages attraction. The AirShip will also be incorporated into the design of the Carnival Cruise Line float which will sail in the Rose Parade on Jan. 1. In a nod to Carnival Cruise Line’s rich history, the line announced today that it will name its new XL-class ship Mardi Gras, bringing back to the fleet the name of the first Carnival Cruise Line ship that entered service in 1972 and started the wave of cruise vacation popularity in the United States. In keeping with its tradition of fun, Carnival revealed the name to a nationwide television audience on the popular game show Wheel of Fortune on its signature Puzzle board at the conclusion of the broadcast. Currently under construction at Meyer Turku in Finland, the 5,200-plus lower berth vessel will offer a variety of new innovations and attractions.